Architectural Styles… thesis, by Roy Fielding; REST is discussed in Section 5. 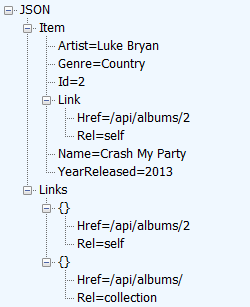 From the code example repository, look at LinkRelations. Add new ‘resource model’ classes that support and enable link relations. 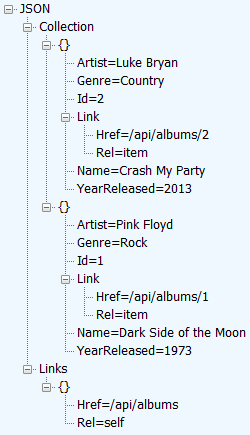 For an entity, add new ‘resource model’ classes that include link relations. Add new AutoMapper definition(s). Update ‘controller’ code. Wrap the fetch result(s) in a resource model class that includes link relations, and configure the links. Here’s a scenario: A user of your web service wants to add a new ‘album’ object. What properties must be provided? Data types? Are there any other constraints? One popular solution is to deliver a template with the response to the ‘get-all’ request. That’s the most natural place for it, because we’re already delivering a link relation for the collection. Add a resource model class for the template. In the code example, it is named “AlbumAddTemplate”. It has string properties. The property names match – exactly – the names of the properties in the “AlbumAdd” resource model class.